After the 1815 eruption of Mount Tambora on the Indonesian island of Sumbawa, the northern hemisphere was plunged into cold and darkness under a cloud of ash, creating what came to be known as ‘the year without a summer.’ It was this phenomenon that was famously recreated in Mary Shelley’s Frankenstein, Or: The Modern Prometheus, published two hundred years ago during a period of general global climate cooling. Responding to the present, different climate disaster, philosopher Delia Hannah has edited a collection of stories, essays, and artworks dealing with environmental crisis under the title A Year Without a Winter, (Columbia University Press, 2018). 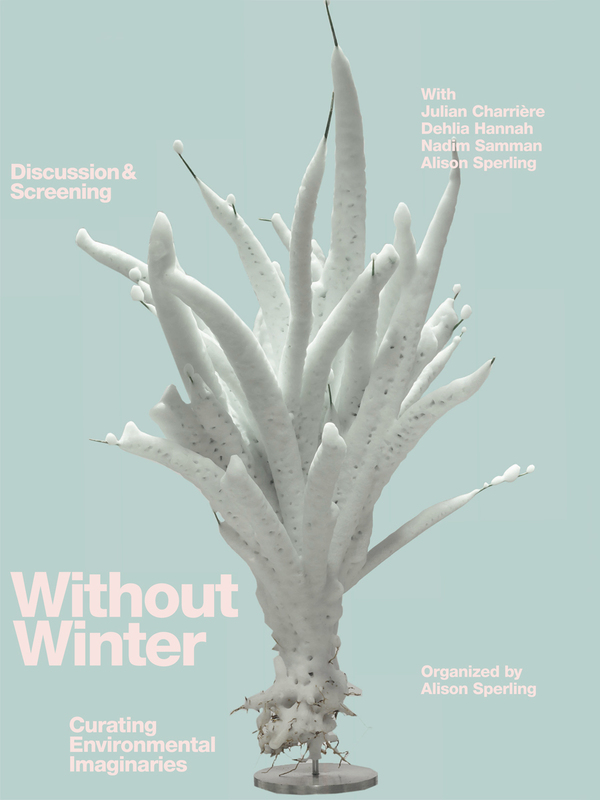 Nadim Samman met Hannah under conditions reminiscent of the opening scenes of Shelley’s novel, at the Antarctic Bienniale he co-curated in 2017. After their meeting, Hannah and the artist Julian Charrière returned to Indonesia to climb the volcano that set this story into motion and encountered landscapes of oil palm cultivation that feature in Charrière’s film An Invitation to Disappear (2018). Julian Charrière is a French-Swiss artist based in Berlin whose work bridges the realms of environmental science and cultural history. Marshalling performance, sculpture, and photography, his projects often stem from fieldwork in remote locations with acute geophysical identities — such as volcanoes, ice-fields, and radioactive sites. To date, his works has explored post-romantic constructions of ‘nature’, and staged tensions between deep or geological timescales and those relating to mankind. Charrière’s approach further reflects upon the myth of the quest and its objects in a globalized age. Dehlia Hannah is a philosopher and curator based in Copenhagen. She holds a PhD in philosophy from Columbia University and is currently Mads Øvlisen Postdoctoral Fellow in Art and Natural Sciences at the Department of Chemistry and Biosciences at Aalborg University in Copenhagen, affiliated with the Laboratory for Past Disaster Science at Aarhus University and the School of Earth and Space Exploration at Arizona State University. A Year Without a Winter was initiated at Arizona State University during her visiting assistant professorship with the School for the Future of Innovation in Society and the School of Art, Media, and Engineering. Her work examines ideas of climate change, nature, and environment through aesthetics and philosophy of science. Nadim Samman is a curator and art historian based in Berlin. He read Philosophy at University College London before receiving his PhD from the Courtauld Institute of Art. He co-founded the 1st Antarctic Biennale (2017) and the Antarctic Pavilion (Venice, 2015-). In 2016 he curated the 5th Moscow International Biennale for Young Art and in 2012 the 4th Marrakech Biennale (with Carson Chan). Other major projects include Treasure of Lima: A Buried Exhibition (a unique site-specific exhibition on the remote Pacific island of Isla del Coco) and Rare Earth (at Thyssen-Bornemisza Art Contemporary, Vienna). In 2014 Foreign Policy Magazine named him among the ‘100 Leading Global Thinkers’. Alison Sperling is a postdoctoral fellow at the ICI Berlin. She received her PhD from the University of Wisconsin-Milwaukee in literature and cultural theory and is preparing her manuscript ‘Weird Modernisms’ for publication. Her current research interests include 20th and 21st century American fiction, science fiction, and the weird, as well as queer and feminist science studies, new(-ish) materialisms, and the Anthropocene.